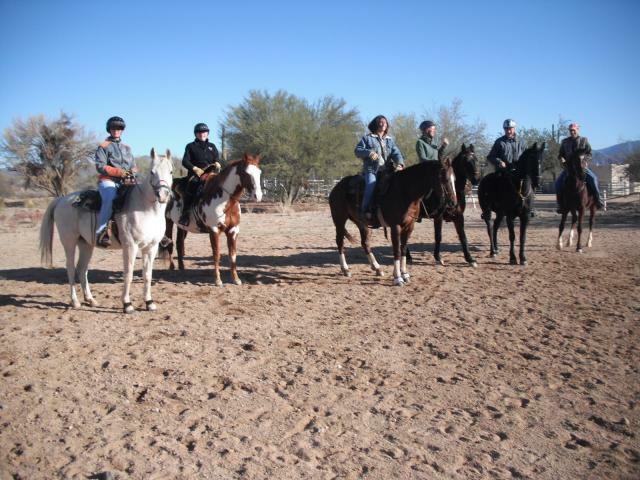 The 2009 year-end Ride started from our house this year and was made up of the usual diversity of horses and riders – from reining horses to paints to arabs. The start is always entertaining, and the group soon broke up into subsections based on speed, behavior and competency. Some people had fun – and others had to work at it. It’s not so dissimilar to the current groups in our own horse communities that form around new methods or equipment or any other criteria you’d care to use. There are little common-interest groups all over the place – some growing and some shrinking. At my place, nothing says ‘I love you’ like a barefoot hoof. One of the best rides of my year happened just yesterday. I got to take Far out on a nine mile loop – and we rode alone. He was soft and supple and easy. He listened to every voice command and took my cues just as I was thinking them. He was forward and willing and he seemed to savor the opportunity to get out and run. I know I did. He had a good year that kept getting better, and the protective horse boots had a lot to do with it. In the last seven months, I went from looking at my herd’s feet and shaking my head to looking at their feet and nodding my head. It’s a great feeling to make that leap into the unknown and then to see such measurable results take place over a relatively short space of time. Tim Lawrence came out to trim the horses today. Tim specialises in natural hoof trimming. 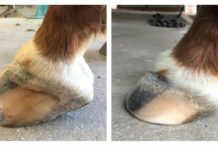 As he put down Rocky’s freshly trimmed foot, Tim said “This is now a textbook foot.” High praise indeed for a horse whose heels were so badly contracted that the shoes were almost egg bar in shape. The frog has grown and spread nicely, the toe is pulled back and the angles look just right. The horse is sound and healthy. Red’s feet are progressing well – there is still some separation of the hoof wall, but much less than when we started. There is some healthy concavity to the sole and the exfoliation process is well under way. The bars are still laying over, but the changes in his feet are impressive. He’ll get there. Far had very high heels when we started him barefoot, and there was a significant amount of contraction. I laid him off for ten weeks after Tevis, which I think slowed down the evolution of his feet. 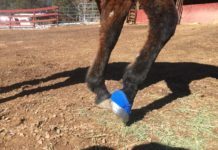 Although there could be more concavity, his feet are hard and healthy; his heels are in a much more manageable state and he is moving more freely now than he was before. Look at the frog of a horse that has never been shod: big and wide and healthy. Rain’s heels also tend to run a little high and there is some hoof wall separation, but he has built good solid feet in his three years on this earth. 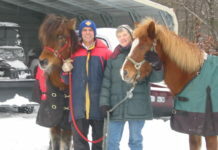 I’m looking forward to the 2010 ride year: these are exciting times in boot development and natural horse care, and this particular community is growing at an impressive rate. And you and I stand to be better for it. First stop: Death Valley XP Four-Day event. Next articleDo You Have a Screw Loose? He doesn’t usually don’t touch the frogs, but most of them were peeling and trapping manure under them, so he tapered them some at the point and on the edges. Far and Rain have higher heels and he was quite aggressive this time at bringing the heel down, and so he rasped a bit of the frog to bring it down to the same new height as the heel. I would agree that taking the callous off the frog increases the risk for sensitivity, but none of them are sore as a result. I think this is only the second time he has played with the frog. Remember I’m the furthes thing from an expert – I’m just relaying what I thought I heard him say :). Feet look great! One question though…pretty much everything I have read/seen about barefoot says not to mess with the frog (unless it has issues like thrush, or flaps trapping manure, etc)…in the pictures, it looks like the frogs have been trimmed as well. What is your trimmer’s reasoning behind that? If it is to bring the frogs level with the trimmed foot (as the pics seem to indicate to me), I have always been told the horse will do that itself after a day or so of being turned out…so unless the horse has issues and is sore (very underdeveloped digital cushions for example) with the frogs raised, I have been told to leave it be and the frogs will go down to the level of the foot pretty quick on their own….trimming them supposedly takes away the callous on the frog, asking for sensitivity…. I really enjoyed this post and the photos. I have been on this adventure now for 4 years. It has been a constant learning experience for sure!! I would also like to comment to John. I have alot of friends who still put shoes on thier horses. And, yes they are not lame (now). 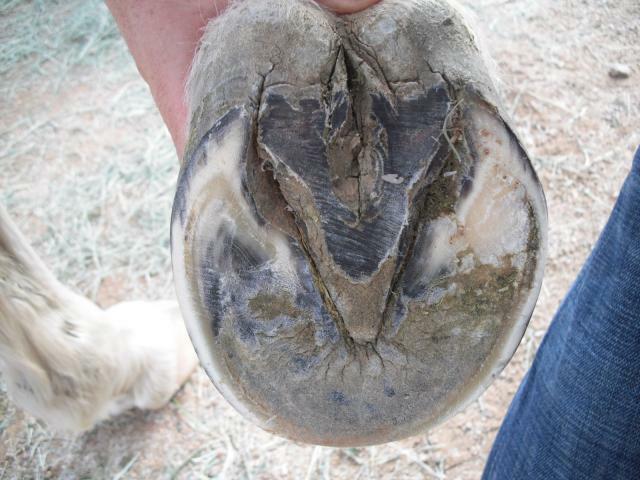 Although some have gone lame with sore hocks, ect, and they pull shoes and give the animal a rest. I know two horses and thier farriers. The farriers are considered the "best" in this area also. 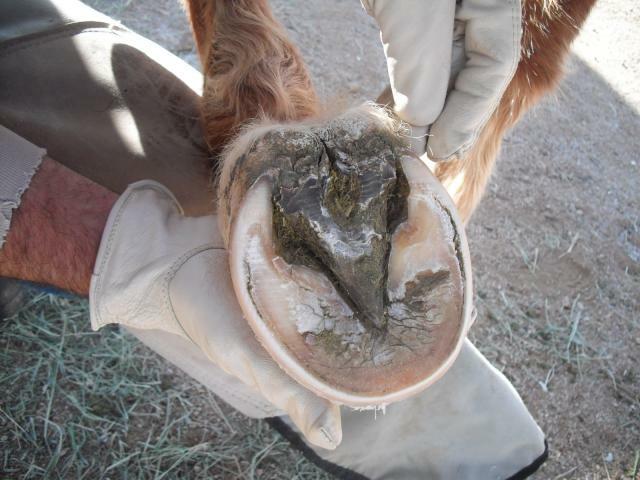 I think that the statement "shoeing ruins" horses is true. Maybe not now, but eventually something will give. 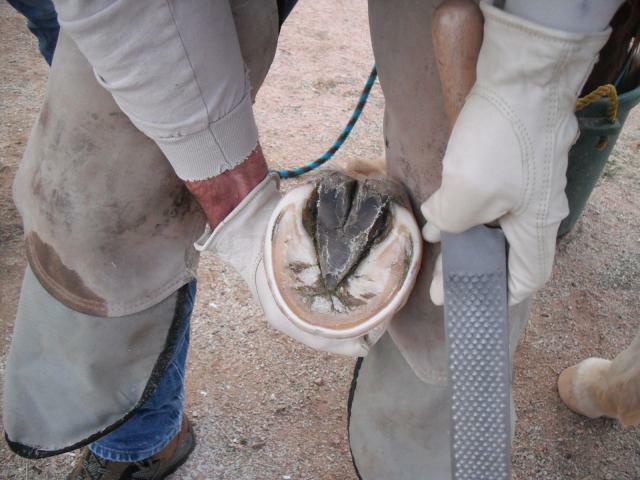 Because of the studies done by Dr. Bowker and others on loading of the hoof wall(which this,was not meant to happen). Correct hoof mechanism and the developement of the frog pad, sensitive frog, digital cushion, and the lateral cart, ect. All of these important hoof mechanisms are out of play when the shoes is appied. 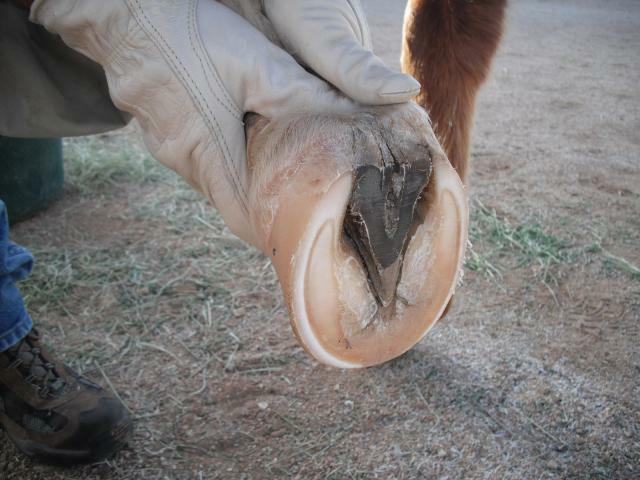 It is all about "hoof mechanism" for the entire health of the horse. I know this is part of the battle. The battle that has brought on so much dislike between the shoed community and the "barefoot" folks. The bad rapping is ugly. My hope for all involved is that the horses will show the way. And, with folks like EasyCare making the needed products for the horses this will be the norm and not the exception. nice looking feet – as a shoer myself for 20 years i’ll be the first to say i don’t have a problem with horse’s going barefoot! Never have. With the shoeing techniques i use i can say however that in almost 20 years shoeing i’ve not had one horse come up lame from them. So the only real problem i have is some of the barefoot people saying "Shoeing RUINS" horses – where i prefer to say "Incorrect" shoeing ruins horses.